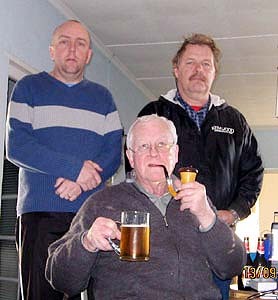 Present at Seefontein were John Plimmer and his wife, (to look after the 70 year old dodderer), Vince Stevens and Derek Duplessis. Vince and Derek got there first in Vince's Landy with all the beverage bamboo supports, radio's, supplies and gear at 11.30 a.m., and they were soon running out the three long beverage wires in the coastal brush. Dawn and I arrived at noon and unpacked and had some lunch and a lager before starting to setup. As this was the fourth or fifth visit for us all, we seem to have got used to the privations of the spartan fisherman's cottage, right on the beach and about a two hour drive North of the city of Cape Town on the Atlantic ocean. Paraffin lamps are used for lighting and gas for cooking and heating the water and the fridge. The brackish brown borehole water is undrinkable so the host supplies 25 liters of drinking water that soon runs out with endless cups of tea and coffee, so Vince brought along another 25 liters that was needed on the last day. The thing that brings us back to Seefontein cottage for the fifth time is the total lack of city/suburban RFI. It just awes me to DX at sunrise and sunset and the S meter has no activity at all. Signals/stations that come in as much as an hour before sunset and an hour after sunrise can be successfully audible and recorded but the S meter on your radio is not even flicking or moving from zero. Amazing! In town we are used to S4 and much more of noise in some locations, severely limiting our DX ability from most town/city based QTH's. Sadly there are not a lot of totally free RFI DX sites left anymore as civilisation spreads and the power companies extend their networks of powerlines even to the remotest farms and communities. The nearest small village to Seefontein is 5 km's/3 miles away and the nearest small powerline is at least 2 km's/1 mile from the remote cottage. Truly leads to the most wonderful DX experience. The prime objective of Seefontein DX site is exotic North American catches, the hope this time was to get some low power stations in the U.S./Canada and some stations in the mid West, and as a bonanza, perhaps a station or two from over the Rockies on the U.S. West Coast. The signal path from the U.S. East coast is direct over sea water to Seefontein, an ideal situation. 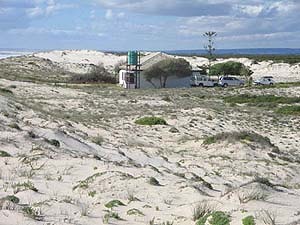 Our other DX site at Jongensgat on the East Indian ocean coast favours reception from Australia and Asia. For my part conditions were slightly above average and I got a good volume of stations from the U.S. and Australia, which was surprisingly strong. Alas, the U.S. West eluded me as did low power stations from there. However, to sum it up my stats reveal that this visit was slightly better than the previous two. The stats being 13 U.S. stations for Seefontein5, 11 for SE4 and 10 for SE3, so I came home well satisfied with my results. Seefontein is a prime west coast location for hearing North American AM stations across 'the pond'. So I had high hopes again this year for some good catches. However I felt it hadn't been as good as I'd hoped. Despite low solar activity, signals from USA were poorer than I expected and the band once again was dominated by South American stations. Strangely enough (for someone who spends 99% of the time DXing mediumwave stations) one of the highlights for me was good signals from two Papua new Guinea stations on Shortwave. I've never heard Radio New Ireland put in such a good signal previously and the other station, radio East Sepik, (although not as strong), was a personal first for me. Nevertheless it was still great to be at a location with minimal noise interference and loads of space to sling up long beverage antennas. Once again many stations from all over the globe put in HUGE signals, unlike anything I can receive at my home locations. For that reason alone, its always worthwhile to go away and spend some time with radio buddies doing what we do best! Modern DXing is so far advanced from the days I started over forty years ago in a remote mining village near the Congo border of Zambia that it is hard to imagine how I got any ID's at all, but somehow I did. There were no essentials like the WRTH manuals or magazines available up there and of course the internet only arrived years later. Now DXer's in many first world countries can DX with the full enormous capabilities of the net and cellphone/data connections even from their DX sites. Today, even if I miss a crucial station ID I can still verify the station if I have other information such as the program format, program name and/or program host. With the vast resources available to DXer's today and from the internet I can now quite easily identify stations at home on my computer which at first I was not too sure of in the field with only my trusty WRTH or other log available. Many serious DXer's now have SDR radio's with vast databases loaded onto their laptops and a wide range of information is instantly available to them as they DX. Surprisingly I have found even the smallest and lowest powered stations have websites with a lot of useful information to aid ID's and on one occasion, after two months digging around the net and trying various stations, I got an e-mail QSL verification from a 58 watt station in Georgia 8,000 miles/13,000 km's from my QTH = lovely! I cannot stress enough the benefit of a good recorder. I used for the first time a new Edirol R-09 mp3 recorder with a 70 hour capacity, so I was able to record lots of what seemed irrelevant material, but later on analysis proved to be good catches that it was not possible to identify in the field. It also allows you to record enough material for sending out for that crucial QSL when station managers are critically going over your offerings. Everyone was all ready to go an hour before sunset, everything all checked out and working faultlessly, and 50 minutes before official sunset Fanglio, Taiwan appeared, soon followed by AIR Nagpur and HLAX Korea. Ten minutes before sunset some of the low power West coast Aussies appeared. The evening looked promising. By 1810z Adelaide appeared, always nice to catch something from the South East of Aussie as it doesn't always come in at Seefontein. 1900z and the more distant Europeans come up, with Vince getting a couple in the UK and I getting Lille, France. Later at 2000z Vince is thrilled to get PNG East Sepik on the Tropical band. 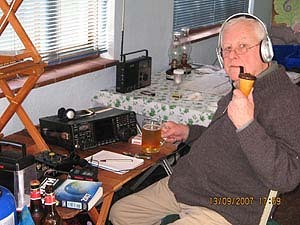 John boozing, smoking and DXing all at the same time! I am up first at 2.00 a.m. and already find a U.S. station WWRU NJ, but the Brazilians are dominating the band and it proves hard work to dig out the Yanks. Strangely, unlike other visits, I find the Kiwa Loop only want's to get the Brazilians, whereas my BOG is doing quite well with the American stations. Just after two a.m I get what I think is a superb catch: WTKA Ann Arbor MI on 500 watts nightime power. Sadly, later at home I find on the web that "ESPN Radio" is syndicated to so many stations I had to dig deep, only to find that the correct station is in fact WEPN NY, NY, a 50 Kw powerhouse. With so many stations now syndicated to media groups it is becoming very hard for us to verify who we are listening to, as the correct station ID is only given quickly and briefly anytime once an hour. However, the syndicated ID is given frequently. As an opening may last only a few minutes, it becomes really tough for us to find the true ID of a station - the internet is a great resource here and usually provides the clues that lead to a positive ID. Catches come in sporadically in the night, but things really hot up as sunrise approaches. I get "Big L" from Holland which pleases me as I have been trying to get that station for yonks. Several more U.S. stations come in, and ten minutes after official sunrise, with the sun well up, I get "San Diego 1700" (XEPE) which is a great catch as this station is around 16,000 km's/10,000 miles away. Good DX is still heard until nearly an hour after sunrise. That ends the session and the other lads go and doss down for some shuteye. My Icom chews battery power, so I have to recharge it every day, but saving me the inconvenience of carting it over to the farm, Derek has brought along a solar panel, so hooks up my battery and it is fully charged again in the evening. I have to entertain Dawn, so we go into Veldrif the nearest town 15 km's away and do some shopping for food and supplies and I drop in on the only internet cafe to catch up on my radio groups mailings. They do a great fresh fish and chips there, so we get enough for all of us and head back for lunch, where the bleary eyed DXer's are just surfacing after their snooze. Again the signals start drifting in an hour before sunrise and a few minutes before I clearly get Japanese, but alas! before I can get an ID it fades out. At 1700z I get an ID of what sounds like R. OBC which is a Japanese station in Osaka, but as I am not sure of it later I post it on the net and find it is actually BBC in UAE speaking in Farsi, a language I am not familiar with. Later Vince gets France Lyon and Bayern Germany and switches to the Tropical band and gets PNG New Ireland, which he is pleased with. The Brazilians are powerful again, but some U.S. stations are coming through. I get 1520 with a lot of references to Oklahoma and I am quite bucked, but frustratingly the only ID they keep giving is "AM 1520" and nothing else. Then 1520 is taken over by a more common station WWKB Buffalo, and later that is taken over by WLAC Nashville, so my great Oklahoma catch vanishes into thin air before I can get a positive ID. Truly like the old proverb of the big fish "that got away"! Vince gets R. Ulster UK, a nice catch, but the session ends with nothing particularly noteworthy. Just near sunrise I get my best catch so far, "San Diego 1700" which is XEPE, Tijuana, Mexico = a great catch! I head into town again with Dawn for more supplies and get some meat for a traditional South African braai (barbecue) that the lads are preparing with some very rusted and primitive utensils. We have a convivial braai well lubricated by liberal shots of Scotch for the lads and some beer for me, then we all doss down for the afternoon. Europe and Australian lows powers come in nicely, the highlight of that session for me being the 2 KW Port Augusta station in South Australia near Adelaide. Vince also gets Greece which is not often heard and I get London and Paris. We are all bushed from days of continuous DXing, so rise a little later this morning, only getting started at 5.00 a.m local time. The U.S. stations are quite strong this last session and we soon get some solid catches, and as sunrise approaches we get the big enchilada's. Vince gets St. Kitts, XERF Mexico, Windsor ON Canada and his big one: KOA Denver CO. He is quite thrilled with that. I get several more U.S. stations and then the catch of a lifetime sneaks in on 1410 Khz. I don't recognise it for what it is then, and only back home a few days later, with the help of fellow hobbyists, the recorded audio clip reveals clearly a callsign "...on C-fun 1410 AM". This confirms it as CFUN Vancouver BC Canada, quite the best catch I ever got in my life and the only station I have ever recorded West of the Rockies. That station is over 10,000 miles/16,000 km's away from Seefontein and just proves that in this great hobby you can even expect the unexpected. At twenty to eight local time the signals fade (50 minutes after sunrise) and it is time for us to pack up and head for home. Putting up the long beverage wires when you arrive all fresh and full of enthusiasm is a breeze, but taking them down at the end when you are dog tired after three days of hard DXing is a real chore. By ten thirty we are all finished and leave for home and the big task of running the recordings and writing everything up. A great DXpedition with great results. Vince's three 300m/100 ft beverages covering Europe/Australia/Asia and over the shoulder to N. America. John's Kiwa MW Loop and a 300m/100 ft BOG laid out on the track to the cottage, pointing to Australia and over the shoulder to N. America. # Vince has listed only logs he considers of interest due to time pressures of his going away.